My focus for this school year will not be on testing, or homework, or even data teams, it will be on LEARNING. I’ve been reading Ditch that Textbook and Teach Like a Pirate this summer, as well as learning from my PLN on Twitter, Voxer and EdCamps. All of these have reinforced the decision I made at the end of school last year to DO THINGS DIFFERENTLY! I will continue with Standards Based Grading but I like the phrase Standards Based Learning better. I will also be providing videos like a flipped classroom would so I can focus on projects and individualized learning in the classroom. I won’t be assigning homework every night, but I will provide outside practice for those who need it. 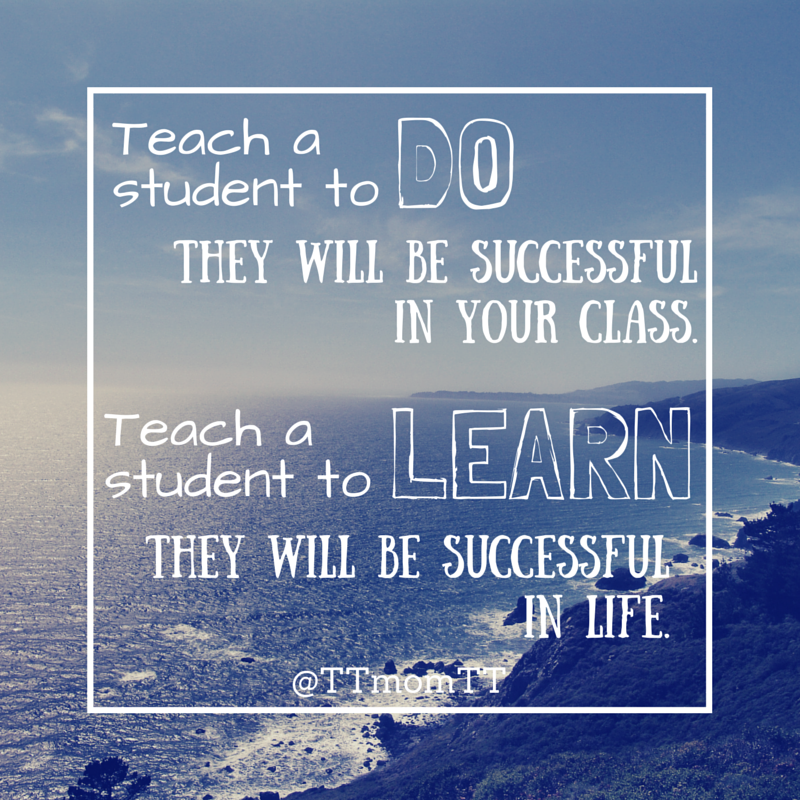 I want students to learn in the way that best suits them. I don’t know how this will work but I’m excited to give it a try. The most important change will be directing the focus on learning and not on a grade. I want to eliminate the question, “What can I do to raise my grade?” I want them to ask, “What can I do to learn?” I can’t wait to have a classroom with students in control of their learning and a desire to be there. I hope my inner Pirate comes out! Their request to the education field, PLEASE STOP. Please stop allowing students to pass through our doors without: learning to be responsible, completing assignments on time, working hard, showing up, and being responsible. Please stop considering basic skills as unnecessary because we have technology. Please stop taking away the sting of failure because then they don’t learn from it. My dinner with the real world has challenged some of my views. I do believe in mastery learning, I do believe that not all students learn at the same time. The real world told me that it costs them money if it takes a person multiple times to learn something. They don’t want to employ that person. I also believe that students must learn to meet deadlines, must learn to work hard and not expect things to be handed to them, and must take ownership of their actions and stop blaming others. The real world agrees with me on that. So where does that leave us in our quest to educate young people, not just academically but for the “real world”? I love learning from and with other educators. It’s almost a condition that I need to seek help for. I was the student who loved college, loved my online learning opportunities for my master’s classes, love conferences, love good PD with our district… I love to learn and improve. This summer, my learning opportunities have been greatly increased. It started with the return of #SJSDEdWeek, WOW so much learning with my fellow colleagues. I left motivated and inspired and grew my PLN from within my own district! Next came ISTE. I didn’t get to attend ISTE, but I did join the #notatiste15 google plus group and Voxer chat. Both Google+ communities and Voxer were new experiences for me. I have a few books to consume this summer, one of them is Ditch That Textbook by @jmattmiller which has a Twitter chat and Voxer group at #DitchBook. I, just tonight, joined the #HackLearning Voxer group. @LauraGilchrist4 created a monster when she added me to the #notatiste15 group. I have become a Voxer junkie, but I love discussing ideas with people inside that medium. It’s July, usually the month I put away my computer and all thoughts of school. This summer I can’t shut my brain off thinking of all the ways I can make learning more relevant to students and help them become learners, not just doers. I can’t wait to share with my students, colleagues, and you as I get to practice some of what I’m learning.